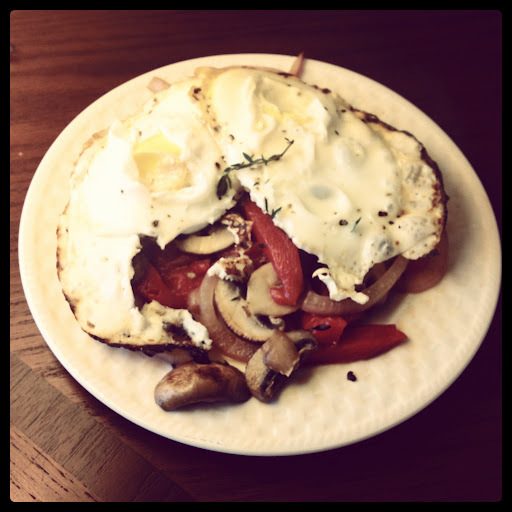 This morning for breakfast, I threw together a few items found in our fridge and it turned out great! Sadly, I was in such a rush, I didn’t take any photos during the process. To be honest, I wasn’t thinking about posting this recipe at all! But, a request for details came in via Twitter, after I posted a picture of the final product; how could I deny their curiosity? 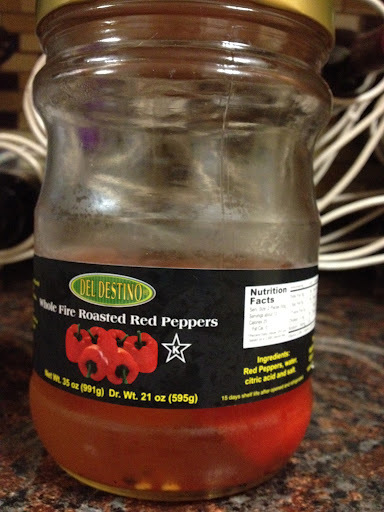 *I used a roasted red bell pepper from a jar (see below for a photo with the brand name); but you could certainly roast your own bell pepper, any color, prior to whipping this up. In fact, it would be best to roast your own because then you know exactly what’s in it–simply a bell pepper. If you buy, like I did, just be mindful (as you probably already are) of the ingredients. It’s amazing what companies sneak into what otherwise ought to be very simple jars of food! 1. With 1 teaspoon of the olive oil, sauté the onion pieces and mushroom slices for about 2 to 3 minutes over medium heat. 2. Toss in the sliced roasted red bell pepper and sprinkle with black pepper, sea salt and thyme. 3. Continue sautéing for 1 to 2 minutes, until bell pepper is heated through and the onion is just about translucent. 4. Plate, cover with tin foil to keep warm (optional), and set aside. 5. Next, cook the eggs. To make them over-hard: Pour the last teaspoon of olive oil into the same skillet in which you sautéed the veggies. Crack the eggs into the skillet. (Optional: sprinkle seasons over the eggs.) Turn down the heat to medium-low and cover the pan. Let it cook for about 2-3 minutes, flip the eggs, and let them cook another 1 to 2 minutes, or until yolk is firm. 6. Plate over your veggies and enjoy! This jar is as free from sugars, additives and other nasties as we have found. Ingredients include Red Peppers, water, citric acid and salt. We buy it at Costco for a good price and once opened it’ll last at least a month (we’ve pushed it to two before) in the fridge.